Making up the third of the flavorful triumvirate on The Idol sa Kusina birthday spread is Loony Mini Pizza. Yes, the playful zing comes from the merry shapes in which comes the little pizzas that are abundantly and generously stacked with meaty, cheesy goodness that children love. 1. Heat oven to 425°F. If using thin crust: Heat oven to 400°F. 2. Spray or grease cookie sheet. Unroll dough on work surface. Press dough into 12x8-inch rectangle. 3. With round cutter, cut dough into 6 rounds. Place rounds 1-inch apart on cookie sheet. Spread each with pesto. Top each with 1 tomato slice. Sprinkle with cheese. 4. Bake classic crust 10 to 12 minutes, thin crust 8 to 10 minutes, or until cheese is melted. 5. 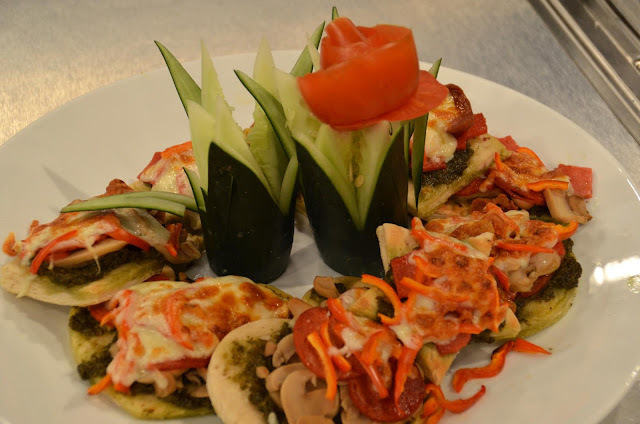 Serve a variety of mini pizzas with your favorite pizza toppings, such as cooked Italian sausage, pepperoni or simply cheese.